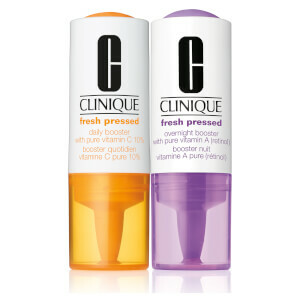 Brighten the complexion with the Clinique Fresh Pressed™ 7-Day System with Pure Vitamin C; an anti-ageing regime that arrives in a weekly dose. The set contains a potent cleansing powder and an innovative, skin-boosting solution. The duo work in synergy to deliver youthful skin that is visibly rejuvenated. Housed in stay-fresh packaging, each Vitamin C product is isolated until exposure to oxygen, which activates the formula and allows for maximum results. Transform the way you cleanse with the Fresh Pressed™ Renewing Powder Cleanser with Pure Vitamin C; a water-activated powder enriched with fresh Vitamin C to brighten the complexion. Forming a luxurious lather upon contact with water, the Fresh Pressed™ formula is effortless to apply and allows for an exhilarating cleansing experience. 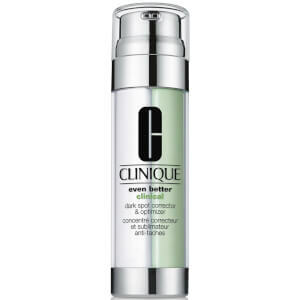 The cleanser delivers instant results, revealing an awakened complexion that is purified, refined and visibly bright. Without stripping skin of essential moisture, the face wash is gentle yet effective and is ideal for preparing skin for the Clinique Fresh Pressed™ Daily Booster. 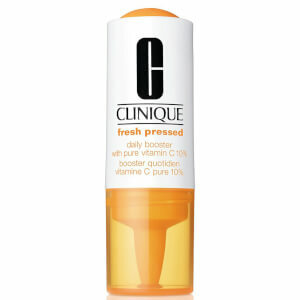 Rejuvenate the complexion with the Fresh Pressed™ Daily Booster with Pure Vitamin C 10%; a concentrated, anti-ageing solution that works to visibly even and brighten skin tone. 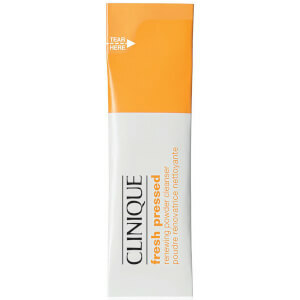 The Fresh Pressed™ solution works as a daily supplement for fatigued, ageing skin. Effortlessly blending into a daily moisturiser, the Vitamin-rich emulsion boosts the hydrators effects, invigorates skin and transforms its texture. Fine lines, wrinkles and age spots are visibly reduced, instantly leaving the complexion bright and youthful. Detergente: versare la polvere sulla mano bagnata. Aggiungere acqua ed emulsionare. Massaggiare delicatamente sulla pelle. Lasciare in posa un minuto per catturare la potenza della vitamina C pura. Booster: lasciare il cappuccio inserito. Rimuovere la linguetta d'alluminio. Premere saldamente il bulbo interno due volte per rilasciare la polvere di vitamina C all'interno dell'emulsione emolliente. Scuotere 15 secondi e prima di ogni uso. Rimuovere il cappuccio. Mischiare due gocce alla crema idratante mattina e sera per potenziare la routine regolare. Il regalo si applica automaticamente al carrello una volta raggiunta la spesa minima. Offeta con durata limitata. Si applicano esclusioni.